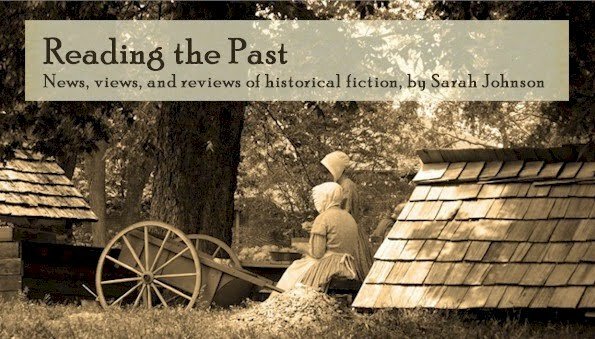 Today we are very happy to bring you an question and answer with one of our favourite historical fiction bloggers, Sarah Johnson. She blogs at Reading the Past and was nice enough to answer a few questions during our blogiversary week. Thanks Sarah! When did you start reading historical fiction and what led you to do so? I've been reading historical novels since childhood. Some that I remember well are Scott O'Dell's Island of the Blue Dolphins, Elizabeth George Speare's The Witch of Blackbird Pond (especially since it was set in Wethersfield, Connecticut, the town next to where I grew up), and Katherine Paterson's 1940s-era novel of sisterly rivalry, Jacob Have I Loved, but my favorite was Patricia Clapp's creepy New England ghost story, Jane-Emily. Most were for school assignments, though I didn't always like what I was forced to read (I didn't care much for Johnny Tremain). Back then I read books of all types and didn't specifically look for historical novels. I started reading historical fiction more deliberately when Anya Seton's Katherine made its way to a 9th-grade reading list. Then I moved on to Seton's other wonderful novels, Norah Lofts' biographical fiction, and then Jean Plaidy, with the historical gothic novels from Katheryn Kimbrough and Catherine Darby mixed in. The days of the neighborhood used bookstore seem to be gone, sadly, but both of these authors wrote extended series that kept me reading for months if not years. Reading the Past debuted in March 2006. It didn't start as a book review blog but as a place to record my (often random and half-baked?) thoughts on what I was reading and the genre as a whole, amusing trends in historical fiction cover art, etc. My first reviews there were based on old, out-of-print books about royalty, which I collect. There weren't many historical fiction blogs then, just a handful, but the blog quickly found an audience, which was encouraging. What would you consider the easiest and hardest things about blogging? An interesting question, and I had to think a bit about the first half. The easiest part must be choosing books to write about. Between my own huge collection of historical novels and review copies I'm offered, I'll be lucky to live long enough to read everything. This spring has been especially overwhelming, with so many great-sounding and diverse historical novels coming out. The hardest would be finding the time to do it all. Plus, coming up with original things to say about a novel can be challenging when the book itself doesn't stand out. Do you have any advice for new authors? New bloggers? For authors: I would suggest they get their marketing efforts started early - which would include setting up a website (and associated blog, FB page, and Twitter account if they're going to have one - and most will be strongly encouraged by their publisher to do so!). A year before publication isn't too far ahead for some of it. They can also get an advance start on checking out blogs that might be good sources for reviews, leaving comments on them, etc. As you know, many historical fiction bloggers are busy and get many requests, so it can help a lot to receive a review query more than 3-4 months ahead of time. I've found the historical fiction blogosphere very welcoming to new bloggers. They can help establish themselves in the community by commenting on their fellow bloggers' sites, linking to them, friending the bloggers on Goodreads and FB, etc. How did you get involved with the HNS? I first heard about it when founder Richard Lee posted about it on a Usenet group, and I joined shortly thereafter. Since I was an avid historical fiction reader, it felt like a good match, especially if its publications could inform me about UK-published novels I didn't know about! That was in 1999. I became a US editor for book reviews a year later and now oversee all of the reviews for the Historical Novels Review print magazine. I've also organized four of their US conferences. Look for the 5th coming up in St. Petersburg, Florida, in 2013, plus our London event this September, where reader Justin Neville and I will be conducting an on-stage interview with Elizabeth Chadwick and Barbara Erskine about their novels. This year marks the 15th anniversary for the Historical Novel Society, and it's amazing to see how much it's grown and how far the genre has come. 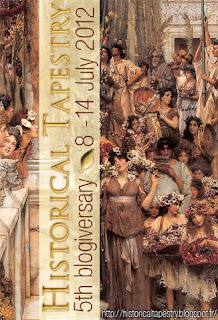 Congratulations to Historical Tapestry on your own anniversary! I'm an avid reader of the site and wish you many more years of blogging. Great interview, Sarah! I loved "Island of the Blue Dolphins" and "The Witch of Blackbird Pond," too, among many other... So glad you're around and reviewing and blogging! Zinnia, that's so true. I wish I read more languages because Kaari Utrio's novels sound fascinating, and different to what I see in the US. I'd love to read more about Finnish history. Thanks, Gillian! Witch of Blackbird Pond stood out for me because there are so few historicals set in Connecticut. I didn't read many of them then, though. Mostly I stuck to teenage romances with fantasy fiction mixed in... until I read Katherine! I think I started with Island of the Blue Dolphins and The Witch of Blackbird Pond too! There are so many fantastic options these days for MG and YA historical fiction, things that I know I would've loved when I was that age. I know - I would have been all over the historical offerings they have now! This is dating me, but YA fiction didn't exist as a category back then, and I really don't remember much children's HF aside from the ones I mentioned. Thanks so much for agreeing to be interviewed, Sarah! I enjoyed your post! Thanks again for asking me, Kailana! Good questions. Thank you for such an interesting interview. I have found many good books by following your blog. I sure hope that Elizabeth Chadwick and Barbara Erskine interview finds its way to YouTube! Thanks, Ana, I've gotten some great ideas from your blogs too. I actually don't know if the interview will be taped. My guess is probably not because there'll be 10 simultaneous sessions, so the technical details to record them all would be complicated, but I'll let you know if it is.